Many ladies think that plain t-shirts is boring and mundane. However, exactly these t-shirts can make a unique and truly exclusive things. 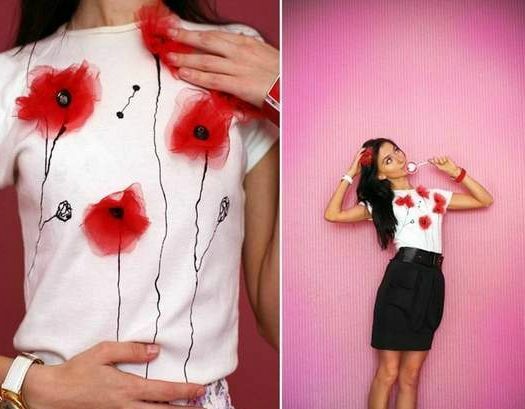 One of the ways to transform everyday plain t-shirt to decorate it with bright scarlet poppies. The process of registration does not take much time, but the result will be amazing! - a lighter or candle. Using scissors, cut out red organza circles with different diameters, gradually reducing their size. The circumference of the fabric will become the petals of poppies. To the edges of the petals do not crumble, sear them with a candle flame or lighter. Be careful, as organza is flammable and burns quickly. You can now engage in the Assembly of flowers. To do this, pick up the workpiece on a thread from large to small, in order to have got a lush red poppies. In some places the petals contracted floss to the flowers was the most natural. Middle of the flower to fasten the bead or button. Black paint for fabric paint on a t-shirt stems of flowers. Start from the bottom of the shirt and move the brush up and slightly extending the line at the top, to get some semblance of a calyx. The stems can be represented by the leaves and unopened buds. Leave the paint to dry completely. Sew the organza poppies in those places t-shirt, which depicts the calyx of flowers. Exclusive blouse with original applique ready. You can get organza other colors and create an original composition, choosing matching shades.